This report examines the effects of the LafargeHolcim merger worldwide and in each of the countries that the company is present. When Lafarge and Holcim merged to form LafargeHolcim in July 2015, they created the largest multinational cement producing company in the world by installed capacity, with control of around 340Mt/yr of cement production capacity. Active in 62 countries, LafargeHolcim is present in a total of 18 European countries (59.2Mt/yr of cement capacity). It is active in three countries in North America (36.2Mt/yr), eight in South America (20.8Mt/yr), 21 in Africa and the Middle East (64.4Mt/yr) and 12 in Asia (169.8Mt/yr). As has been known for many months, assets will have to be sold in some jurisdictions in order to allow approval by the relevant competition authorities. 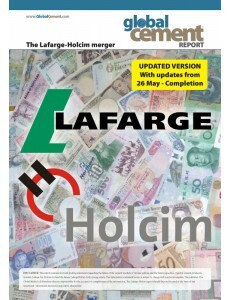 The Lafarge-Holcim merger report therefore outlines the 'before and after' financial situations and geographic footprints of Lafarge, Holcim and LafargeHolcim globally and locally, quantifying changes to their global interests and market shares in each individual country in which either Lafarge or Holcim currently has a cement industry presence. The LafargeHolcim position will be unchanged relative to the prior Lafarge or Holcim positions in 44 countries due to there being only Lafarge or Holcim assets in those countries before the merger. LafargeHolcim will have to sell selected assets in 10 countries in which both Lafarge and Holcim currently operate, due to competition concerns. It will take on the full assets of Lafarge and Holcim in eight countries but will also depart three markets in which Lafarge or Holcim had cement-making assets prior to the merger.